The minivan is a vehicle that is ultra-practical for a number of different demographics. 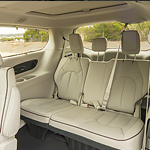 This year's Chrysler Pacifica offers a number of interior features that really rounds out this package, making it one of the top vehicles in its class this year. From a variety of seating arrangements (243 in total) to tons of cargo space, you'll love what Chrysler has cooked up this year. If you've ever had a minivan before, you'll appreciate some of the small interior details in the Pacifica. To let people into the third row of your vehicle, you can simply tilt forward the second-row seat on each side. This provides simple access for people who don't want to climb through the entire vehicle to get into their seat. Leather trimmed seats give the interior a very rich look.